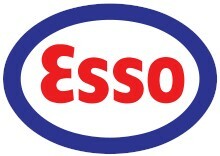 Esso is still there, outside the U.S. But some places in the U.S. used to get Enco (it was the same company) after 1958. It's what we had in California. You'd pull up and the service man came out in his bow-tie. Company policy I think!